Join our monthly meet ups – come and find out what we have planned, meet fellow creatives and get involved! Meet other crafters for an informal catch up, share ideas and inspiration and get updates from the #btnetsy team to help you make the most of team opportunities. Open to all whether you’re thinking of setting up a shop or a seasoned Etsy seller looking to catch up with the team. 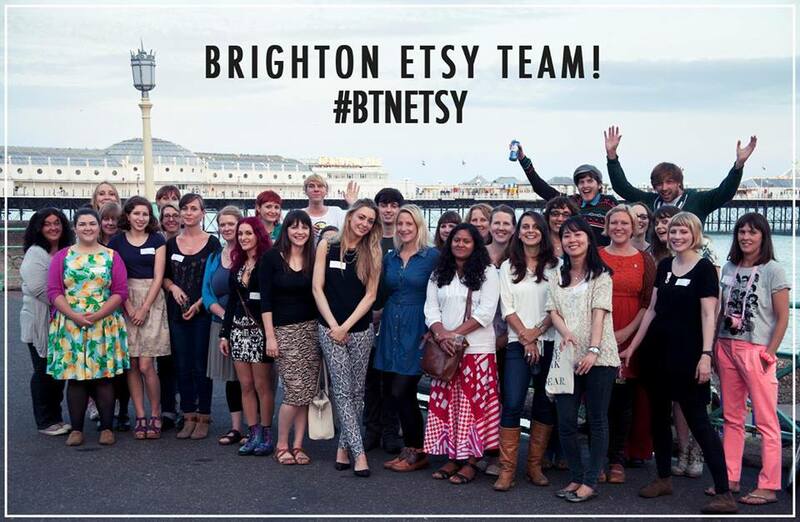 Join us for the first Brighton Etsy meet up with the new leadership team! We are looking forward to seeing lots of new faces as well as the regular Brighton Etsy sellers and chatting to you about upcoming plans for the team. Come along to The Square from 9.30am on Friday 8th March and get yourself a drink and maybe a slice of cake and the agenda part of meeting will start at 10am. Lola Hoad is a letterer, designer and mentor based in Brighton. She owns LH design, an independent design studio creating handlettered paper goods, and One Girl Band, a collective for self employed women to help empower and support one another. This month’s BTN ETSY TALK is a super star Instagram Q&A session by Cheska Mooshpie with guest speakers boasting over 120 thousand followers between them…. Tuesday 19th July, 7.30pm: Aidan of Print Wagon. We are really looking forward to Aidan of Print Wagon coming to talk to us about his touring adventures and running a successful business. The talk is on Tuesday 19th July at the Old Market in Brighton, doors open at 7pm and the talk will begin at about 7:30. View our Facebook event for more details and map. Ebonie Allard – Entrepreneur Enabler – Wednesday 20th April at the Old Market. Feb 22nd 2016, Alice Tams, Birds in Hats. The Old Market, Hove. Thomas tells LICK’s Story – Wednesday November 25th, 7pm, The Old Market, Hove. Find out more and join our event here. 30th September (The Old Market, Hove), Claire Potter talks Eco Design. Join our event and find out more here. Your blog and the blogs of others are a great opportunity to build your Etsy store’s brand, this practical session will take you through some great ways to find ideas for content for your own blog and build great relationships with other bloggers who will help get the word out about your store. This talk will be run by Kelvin Newamn, Marketing Director at SiteVisibility and Alex Hepworth, Digital Content & PR Campaign Manager, SiteVisibility. April 21st 2015, 7pm, The Old Market, Hove. Brighton Etsy April Talk: Why Happiness Should be your Business Model by The Happy Start Up School. Find out more on our blog here. Ladybird Likes: Wednesday 25th February at the Old Market in Brighton, doors open at 7pm and the talk will begin at about 7:30. The wonderful Zoe Bateman is the face behind the successful Ladybird Likes. She’ll be sharing her Etsy journey with us on 25th February, talking us through how she went from a start up to the Etsy shop success you see today. This talk is perfect for inspiring you and getting you fired up about what you can achieve in 2015.